Before I became a knit designer, I used to think about how cool it would be to be a knit designer. Knit all day? That sounds great! Yes, yes it does. But, now that I am a knit designer, I can tell you, while, yes, it is a lot of knitting, there's also A LOT of other things you have to do that aren't knitting. Sample knitters to the rescue! In the above graphic, you'll see some of the pieces knit by sample knitters in my new book, Stunning Stitches. 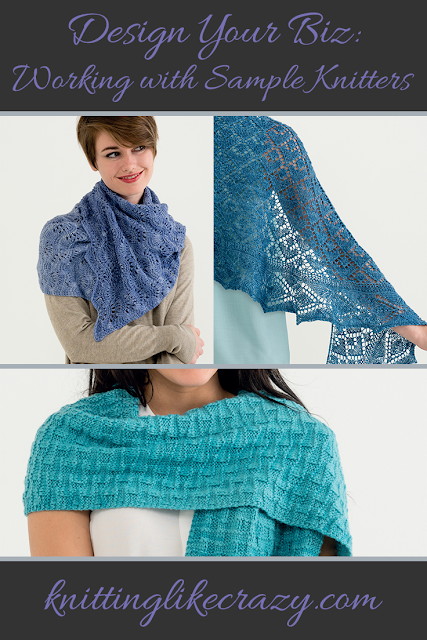 That's the Violetear Cowl (top-left), Glarus Shawl (top-right) and the Cyprus Stole (bottom). We've talked about it before. Sample knitters are different than test knitters. You're paying them to knit a finished sample for you. One that you, as a designer, are probably planning to keep or send to a third-party for them to keep. You must return the completed sample back by the specified date to get paid. One row short (except, in some cases, the bind off, see rule 2), you don't get paid. Does this seem a little harsh? Really - one row short and you don't get paid? Yep, but I'm on a deadline too. If my sample knitter is doing a a giant lace shawl for me, one last row takes time. Time I didn't work into the already tight schedule. I'll bind off that shawl, thank you very much. I'm happy to have a gauge discussion with my sample knitters to make sure we get something we both like. Now that I work with the same few sample knitters, I pretty much know who has to go up a needle size and down a needle size, so I've gotten a lot better at saying "you'll probably need to knit this on a US 6" or whatever. If you find a mistake in the pattern, please don't guess, message me. Since these are finished samples, we can't take any chances on having some weird thing going on because of a small error in the pattern. If you aren't going to make the deadline, message me as soon as possible. When a sample knitter lets me know early on something has come up to prevent her from finishing on time, maybe I can adjust the deadline. Once in awhile there is wiggle room. Those are the main guidelines I have. Sometimes there might be more added in depending on the project. Now that I'm down to a core of very trust-worthy sample knitters, I never have problems. Everyone does great work, meets the deadlines, and everyone is getting paid. Are you a sample knitter? Do you use sample knitters? I'd love to hear about your experiences and guidelines! Images from Stunning Stitches by Jen Lucas, Martingale, 2017; used with permission. Photos by Brent Kane. All rights reserved. Disclaimer: This post contains Amazon Affiliate links.